Many people plant herbs and vegetables every year in their garden, but most of the herbs end up going to waste. This is because herbs grow in abundance in the summer and we typically don’t take the time to clip them and dry them out. Drying out herbs has a multitude of uses beyond cooking, including many DIYs such as herbal bath tea sachets, drinking tea, infused body oils, and lavender dyer sheets. In this post I will show you how easy it is to dry out your summer herbs and some of the DIYs that I like doing with my dried herbs. If you like this post let me know by commenting down below. Subscribe to my blog to get email updates every time I post, and follow me on Instagram @GutsyFeeling to get more updates from me on my day to day life. P.S. Starting tomorrow, Monday August 20, I will have a 3 part series starting on this blog. This will be all about developing greater self love, happiness, and self care in your life. This series will include journal prompts to help you reflect and develop new goals around the themes of love and happiness. I would love for you to join me in this week long journey. Go into your garden and clip all the herbs that you desire. Once this is done, make sure to give them a good shake to make sure you leave all the spiders and bugs outside. Fill your kitchen sink or a large bowl full of water. Place all the herbs in the water, or you can do it in multiple batches depending on the size of your water container/sink. Let them soak for about 5 minutes before continuing. Fill another bowl with clean water and place it next to the sink/original bowl that the herbs are in. Take the herbs out, one stem at a time, and dunk them into the bowl of fresh water. At this point you can either lay them flat on a towel, or repeat the cleaning process again. I like to repeat the process for any herbs that I find particularly dirty. Once all the herbs have gone through the rinse place them well spaced out on a towel. Once this is done, take another towel and gently pat the herbs dry. Leave them on the towel for about 30 minutes before continuing on to either 5A or 5B. This step is meant for your denser cooking herbs such as rosemary, parsley, basil, thyme, mint etc. Group your herbs into small batches based on type. Then you will want to take your string or twine to tie the herbs together at the base of there stems. Each herb is shaped different so try to do this as best as you can so that the bunches can hang upside down. Once all the herbs are tied in batches, hang them from a clothes line or anywhere out of the way. I hung them on a close line in the basement of my house. From here it will take about 2-3 weeks depending on the herb to fully dry up. This step is meant for more fine and delicate herbs such as chamomile, lavender, etc. As opposed to hang drying you can take your herbs and simply space them out under a ceiling fan. After about a day you will see that your herbs will be dried up because they are a finer leaved herb. **Use your discretion on whether you think you should use step 5A or 5B. Baths are something I love to take in the winter months, but also anytime of the year when I need to relax or unwind. I typically will use some bath salts and a few drops of lavender oil. However, I will also make these sachets of dried herbs to really amp up my bath experience from time to time. These can also be used in the shower if you are short on time but still want an aromatic experience. Place the desired herbs into the sachet or tea bag. When taking a bath, run the water over the bag of herbs in order to make bath tea water. It is easiest to hook the sachet around the faucet and let it hang. 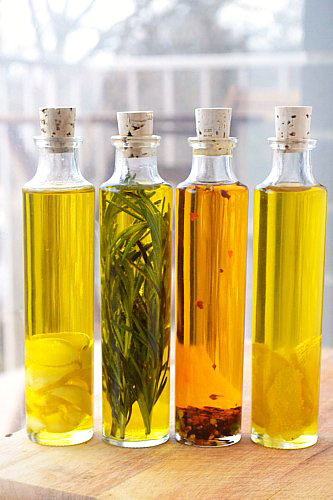 Making your own cooking or body oils can save you a lot of money. Plus it allows you the freedom to completely customize the herbs that you place in your oil. It is important that sterilized jars are used in order to have the best product. Ensure that the jars are completely dry before proceeding. Place a small amount of your favorite dried herbs into the bottle. Heat the oil on low heat in a saucepan just until it is warm. Once it is warm, carefully pour the oil into the jar. If you are using fresh herbs, you must strain them out once the oil cools. If you are using dried herbs you can leave them in the oil, however, it will remain fresher longer if they are also removed. Seal the bottles and place them in a cool spot, out of sunlight for about 1 week before use. Note: These oils should be used up by about 2 months after making. Some good herbs to infuse for cooking are as followed basil, bay, chives, cilantro, dill, mint, marjoram, oregano, rosemary, tarragon, and thyme. You could also add things like citrus peel and dried berries, for even more flavor. A similar idea could be done using argon oil and other herbs such as lavender, chamomile and eucalyptus to make a body oil. Another great way to use dried herbs is by making some DIY dryer sheets. I personally am very sensitive to scent and have been using scent-less detergent for years. The only scent that I can handle is natural products such as herbs, either in a dried form or in essential oils. Therefore, this is a great way to add natural scent to your laundry without all the chemicals. If you are sewing these pouches, take the time to pin them and sew them. You want to make them about 4″ by 4″. Make sure to leave one side open in order to place the herbs in before completely sewing the pouch. Simply use some of your favorite dried herbs for these dryer bags. I personally like lavender, chamomile, and peppermint. You can reuse these bags about 15-20 times before they need to be refreshed with new herbs. As you can see dried herbs have many uses and can be very useful for many things around the house beyond cooking. So, take the time to cut your herbs before winter approaches and take advantage of some of these easy DIYs. If you have any other uses for herbs let me know in the comments down below. Subscribe to my blog to get email updates every time I post, and follow me on Instagram @GutsyFeeling to get more updates from me on my day to day life.